"How come it was more fun when you were a kid?" We're generally opposed to the Asian plants that have made it into our local woods, but the wineberry (Rubus phoenicolasius) might be one exception. For several weeks in July, these relatives of our native raspberries are abundant and delicious. And, if we can get to the berries before the birds do, and keep the plants from spreading, all the better. Get out there and do your part! You've probably seen wineberries in the woods, but you may not have known what they were. Like other raspberries, wineberries grow on canes that grow up, then arch over to root and start another plant. With this growth habit, they can create large thickets. 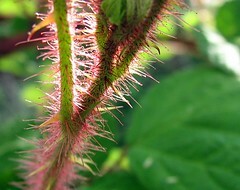 Unfortunately, their stems are covered in pinkish bristles -- they can give you quite a scratch if you're not careful. All raspberries have leaves of three, but those prickles are a key distinguishing characteristic that will help you tell the difference between wineberries and poison ivy (which has smooth stems). In addition, the undersides of the leaves are much whiter underneath than on top. But at this time of year, the give-away is the clusters of red berries. They are shiny -- each one is like a collection of little glass balls. Wineberries darken and sweeten as they get riper. In general, though, even when they're very ripe, they're a little tarter than cultivated raspberries. For the sweetest berries, you want the ones that fall right off when you go to pick them, leaving behind the cone-shaped receptacle that they were growing on. Be gentle with them -- they can crush easily. In the wild: The two most abundant wineberry spots we know of are along the C&O Canal near Chain Bridge, and Seneca Creek State Park in Gaithersburg (Matt will be leading a wild edibles hike there on August 1 -- let's hope the berries are still producing!). But they are scattered throughout other parks as well. In your yard: Try planting a native raspberry, like the black raspberry, Rubus occidentalis. It ripens a little earlier (ours started in mid-June) and the flavor is sweeter. We love them both, but the blackcaps could use all the help they can get against the invasive wineberries.